Customer service is one of the most crucial departments in any business. Customer-facing employees portray the image of the company in the eyes of the consumer, and one encounter with an employee can make or break a sale. Organizations with poor customer service or inadequate customer-facing employees risk losing potential clients, and often lose business rather than retain it. Learn how to ensure customer satisfaction. Not all employees will value the importance of excellent customer service. Although some applicants may be qualified to do the job, they may not have the personality to service others. Customer service assessments like the PROFILES CUSTOMER SERVICE PROFILE™ can measure how well a person fits specific customer service jobs within an organization. These assessments evaluate each individual's behaviours, attitudes, and skills to determine who is most capable of holding a customer-facing position. Placing a person with poor communication skills or a melancholy attitude in a customer-facing position can result in losing customers rather than gaining them. 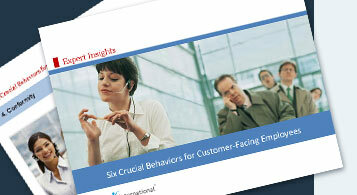 How can companies know if their customers are satisfied with their customer service departments? Customer loyalty surveying tools such as PROFILES LOYALTYPRO™ are available to gather ongoing, critical account intelligence that helps to assess the relationship between the business and the consumer. Insight into the customer's perception of the existing business relationship allows businesses to create a targeted strategy for customer-facing teams in order to continually improve the consumer's relationship with the company. A company interested in serving customers on every level possible should invest in both customer service assessments and adequate training. These tools are designed to give companies the necessary insight to excel in customer service. One bad experience can ruin a string of potential customer's perception of a company. Having the right people in the right place will enable businesses to exceed customers' expectations and generate more business through their stellar reputation.